Official warned governor's husband that situation could bring "embarrassment"
ANCHORAGE, Alaska (CNN) -- Top state police officials urged Alaska Gov. Sarah Palin's aides and husband to stop pushing for the firing of her ex-brother-in-law, with one warning it could cause "an extreme amount of discomfort and embarrassment." Gov. Sarah Palin says she has been "cleared of any legal wrongdoing." That warning from John Glass, Alaska's deputy commissioner of public safety, is included in a state investigator's report that found Palin unlawfully abused her authority to press for the dismissal of Mike Wooten, her sister's ex-husband, from the state trooper force. Glass said he warned Palin's husband, Todd, that disciplinary action already had been taken against the trooper and that "we could not fire him," according to the report, which was released Friday. "And I also warned him that it was going to cause some extreme amount of discomfort and embarrassment for the governor if they pursued this and it should never have become public. That it would just be not good for the governor if it continued, and that they needed to cease and desist," Glass told former Anchorage prosecutor Stephen Branchflower, the report's author. The report was commissioned by a bipartisan Alaska Legislature committee panel investigating Palin's July dismissal of Public Safety Commissioner Walt Monegan. The report found Monegan's refusal to fire Wooten was "likely a contributing factor" to Monegan's dismissal, but Palin -- now the running mate of GOP presidential candidate Sen. John McCain -- had the authority as governor to fire him. Glass is a former police chief of Palin's hometown of Wasilla and a snowmobiling friend of Todd Palin. In Todd Palin's account of Glass' warning, which took place in early spring 2008, he said Glass told him, "I'm telling you as a friend, I love the governor, but I am telling you, stay away from this Wooten situation." "I felt it was more of the same with troopers protecting a 'brother' officer," Todd Palin told Branchflower in written answers provided through his attorney. They were delivered on Wednesday, after he had resisted a subpoena for three weeks, and were not included in Friday's report. Glass said Sarah Palin had been questioning the loyalty of state police officials before Monegan's firing. But Glass added: "I don't think there's anybody that would really question our loyalty to her, because we have been trying to avoid this whole situation." The Branchflower report found Todd Palin used the governor's office and its resources to press Monegan directly for Wooten's firing, and that the governor did nothing to stop it. Palin attorney Thomas Van Flein said Monday that Branchflower's conclusion that Palin had violated state ethics law was wrong, because no financial interest was involved. Palin told reporters over the weekend that she had been "cleared of any legal wrongdoing, any hint of any kind of unethical activity there." In September, McCain-Palin campaign officials said Monegan was fired for insubordination when he continued to press for programs the governor opposed. Documents and statements released by Palin's office show Monegan had clashed with administration officials over budget issues. Monegan has said he never received a direct order to fire Wooten. But he told Branchflower that complaints from Todd Palin and administration officials were the "central theme" of his 17-month tenure. "So obviously, in my mind, the governor wanted me to fire Mike Wooten," Monegan said, according to the report. In the report, Monegan and Glass say they warned state officials that they could be sued personally for a wrongful dismissal. Monegan said he told former Palin chief of staff Mike Tibbles that Wooten could "own your house" if he sued. Glass said he delivered a similar warning to Frank Bailey, a Palin adviser who had called a state police lieutenant to raise complaints about Wooten. 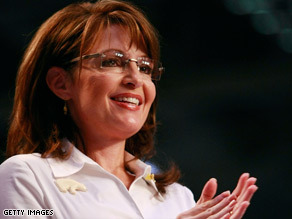 Palin has repeatedly described Wooten as a "rogue trooper" who threatened her family during his 2005 divorce from her sister. Complaints from her family led to a five-day suspension for Wooten in 2006 after his superiors determined he illegally shot a moose using his wife's hunting permit, drove his patrol car with an open beer and used a Taser on his 10-year-old stepson "in a training capacity." Glass said he was "livid" after the Ketchikan-based lieutenant reported Bailey's call to him and told Bailey that Wooten already had been suspended for the same complaints. "If we did go back and fire him for that, it would probably be viewed upon by, you know, the courts and stuff that it would be a wrongful discharge," Glass recounted. "When you do fire somebody wrongfully like that and you do so outside the scope of your employment, you then become personally liable for that." Bailey's call to Lt. Rodney Dial -- which was recorded by the Ketchikan dispatch system -- was disclosed by Palin in an August news conference in which she pledged to cooperate with the Branchflower investigation. Bailey told Glass he called Dial because Dial used to attend the same church as the governor. In a sworn statement submitted to Branchflower, Bailey said he "overstepped my boundaries" with the call. "I should not have spoken for the governor, or Todd for that matter," he said. "I went out on my own in this discussion." Violations of the state's Executive Branch Ethics Act are assessed by the Alaska Personnel Board and can lead to a fine of up to $5,000. The governor already has asked the Personnel Board to conduct its own investigation into Monegan's firing -- a move she launched after becoming McCain's vice presidential nominee, declaring the agency the proper legal venue for any investigation. Palin and her husband are scheduled to give statements to the Personnel Board's investigator, Timothy Petumenos, on October 23 or 24, said Palin attorney Van Flein. He said he would be surprised if Petumenos did not read the Branchflower report, "but I do know he is going on his own individual investigation and is not going to rely on what Branchflower did." The three-member board meets November 3, but its agenda does not list specific cases for review. Van Flein said he did not know whether the governor's case would be addressed in that meeting, held the day before the presidential election.